What a fantastic Saturday we had last weekend! 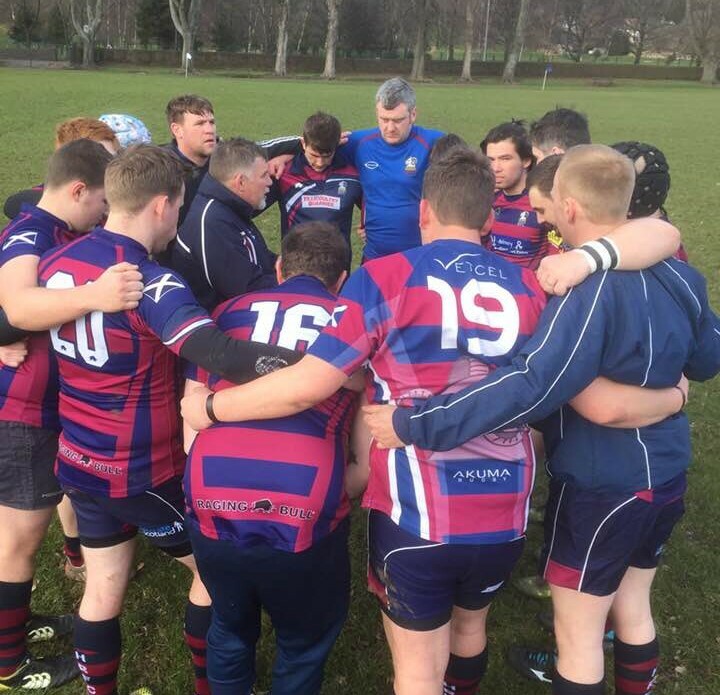 The 1st XV travelled down the road to Dundee and put on a great show against Morgan Academy FP RFC who could not compete against the ‘Foots fast pace and well executed drills. It’s all to play for this weekend! 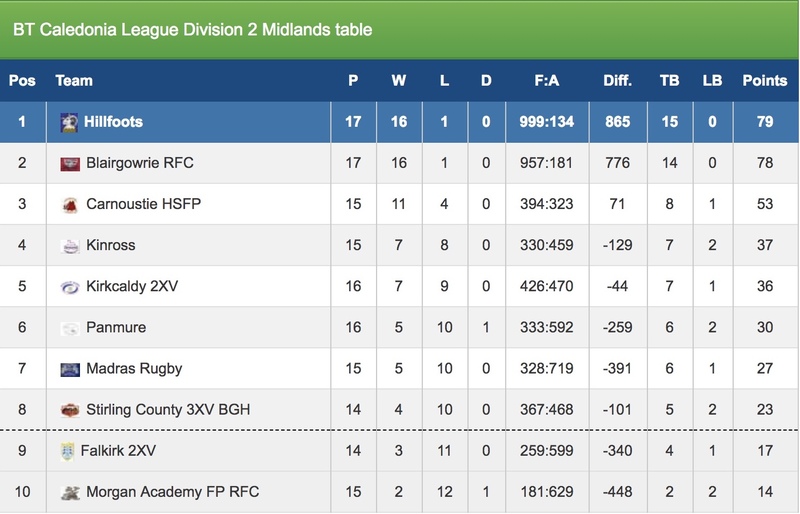 The table shows that we retain our slender lead over Blairgowrie by a point and I am sure that the team will be focussed on finishing the season in style with a bonus point win, loads of tries and more great rugby. We would love to see you all down in the Park to support the team and see in the season in style! The Bar will be open and we have live music to kick the evening off in style! 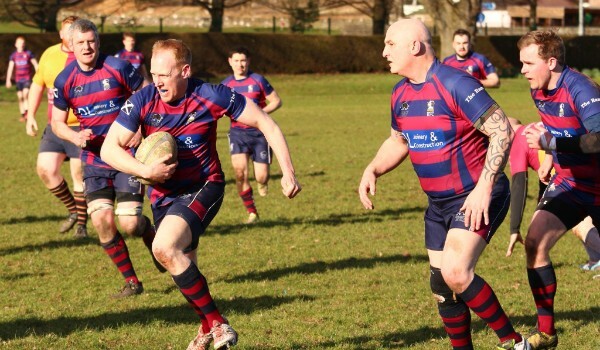 The Rams had a cracking result at home against our friendly rivals Bannockburn – great to see the mix of wise old heads and aspiring young players! 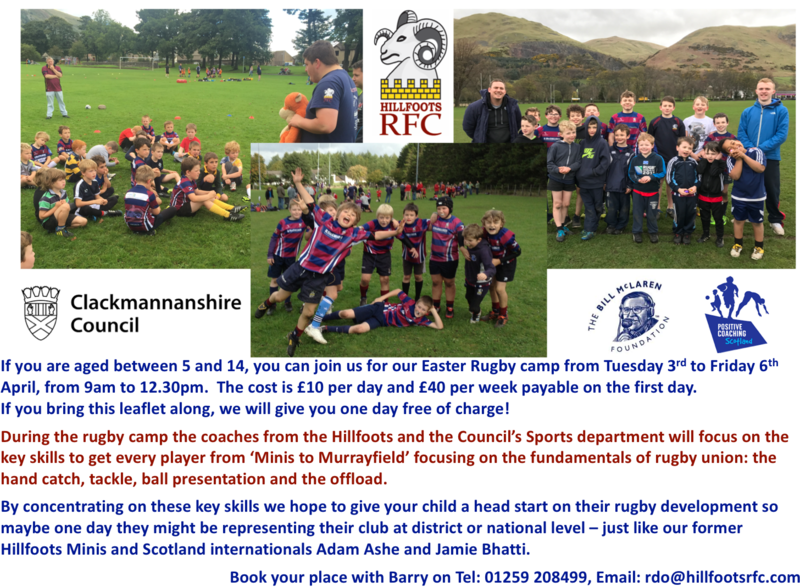 Hopefully this season’s ‘developmental league’ will put in a good position to have some regular rugby next season and develop the depth to our sides that we need to progress ever further! 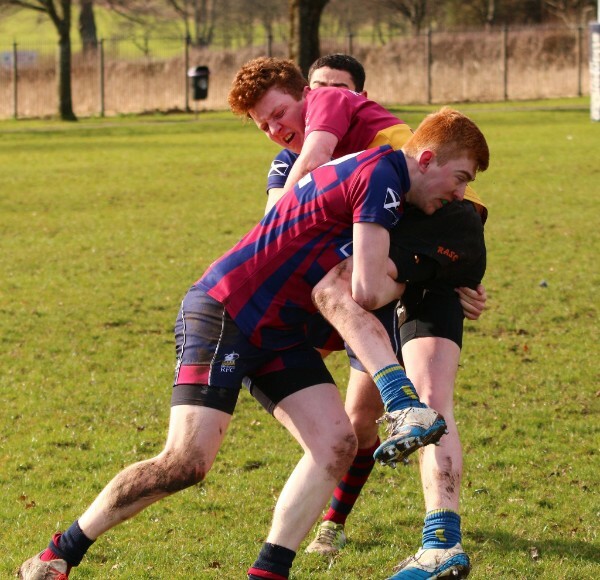 While not a win, the Youth had a fantastic game of rugby against Blairgowrie at Falkirk on Sunday. It was real end to end rugby with the visitors ultimately coming away with a win 38 to 31. Finally – our raffle for some great prizes has been launched on the website where you can electronically enter the raffle, or wait and get a paper ticket tomorrow. The prizes are outstanding! A unique Scotland shirt signed by some of the touring All Blacks from last year’s Autumn International; a Scotland shirt signed by the Calcutta Cup winning Squad; and a fantastic bottle of whisky kindly donated by Russell Sharp. You have got to be in it to win it! This is your chance to get your hands on some special rugby memorabilia! It ranges from a unique Scotland Rugby Shirt signed by some of the New Zealand Touring side from last year’s Autumn Internationals, a Scotland rugby shirt signed by the Calcutta Cup winning side and for the whisky drinkers one of the last remaining bottles of whisky from the Rosebank Distillery in Falkirk. 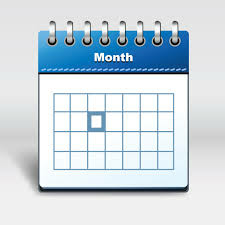 All you have to do is see one of the members of the Club with paper tickets or sign up using Go-Cardless using this link and we will enter you in the raffle. The one ticket gives you the chance of winning one of the three prizes! Back in November, Eddie Inglis and I were honoured to have been invited to the President’s Suite for the Scotland v New Zealand match. We had a fantastic day meeting more or less every possible former Scottish international – not least the indomitable Doddie Weir who launched his charity that evening. For those that do not know, the players from both sides eat in a different room from us mere mortals and then come in briefly for the Captain’s speeches, presentation of first caps and a quick beer if they are lucky! 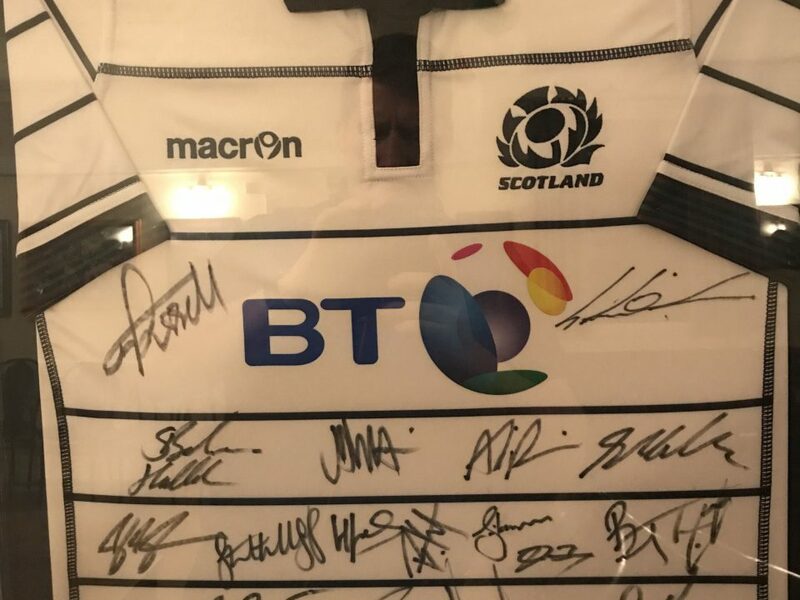 I had planned ahead and had bought a Scotland shirt and went around as many All Blacks as I could find to ask them to sign the shirt that we are now raffling – the signatures were scribbled on my hand, back and any surface that I could find for them to lean on! I do not think I am exaggerating by saying it is unique! You can clearly see, Kieran Reid under the thistle, Steve Hansen and Beauden Barrett, Ardie Savea, Sam Kane, Sonny Bill Williams, Sam Whitelock to name but a few! For only £10 you have the chance of winning this unique shirt! We were also fortunate to have had the opportunity to send our Club Development Officer Barry Munro to experience Murrayfield and the Captain’s Run prior to the Calcutta game! Barry was royally hosted by the SRU and Al Kellock who took the lucky few around the stadium on a grand tour. The highlight was having the opportunity to get autographs from the team, so Barry has kindly given us this shirt to auction off too! While not as unique as the All Black’s shirt – it will be a reminder of that special day when Scotland fought and won the Calcutta Cup back! 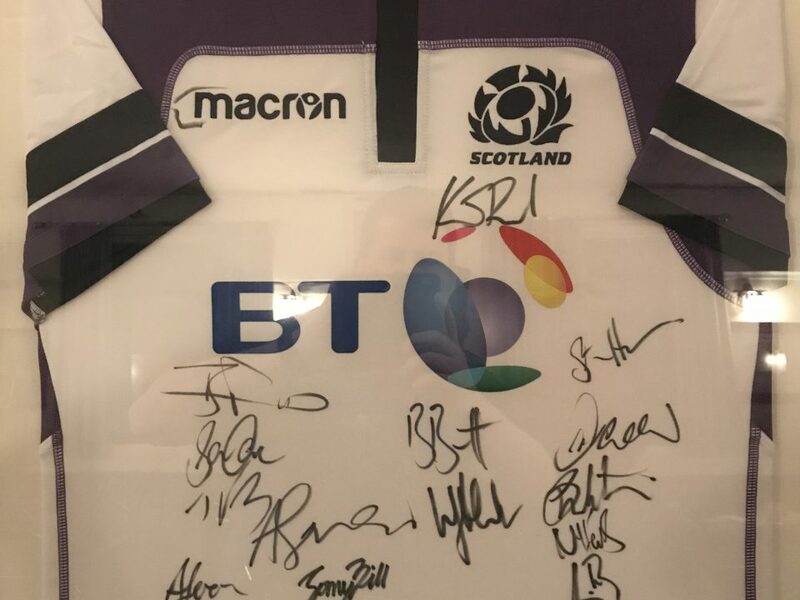 Most rugby internationals seem incapable of writing legibly, but I am reliably informed that it is Greig Laidlaw’s signature under the thistle and Finn Russell’s opposite that! The rest you will have to decipher! For only £10 you have the chance of winning this fantastic memento of a great Calcutta Cup win! Last but by no means least we have a treat for whisky connoisseurs! Sadly the Rosebank Distillery at Camelon, founded in 1798 stopped distilling in 1993 before being sold off and developed as houses. Thanks to Russell Sharp, who has graciously given the Club a bottle of 12 year old Single Malt from the distillery. It was described in its heyday as a ‘light and distinctive’ malt whose flavour was well-balanced – many considered it to be the finest Lowland malt and Jim Murray (of the Complete Book of Whisky fame) believes it should rank in the top five of all Scottish Malts! If you Google it you will see that the Whisky Exchange is selling a bottle for £375 and the Whisky Barrel is selling a bottle for £1999.96! For only £10 you have the chance of winning this historic bottle of whisky! 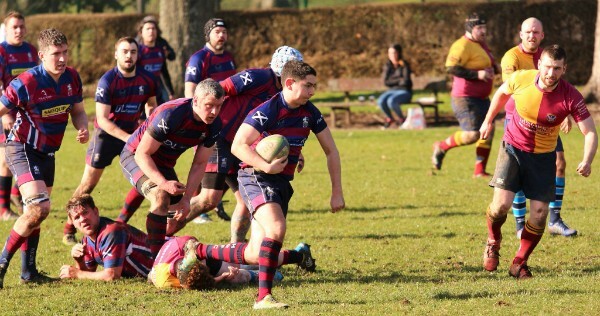 The Rams welcomed old rivals Bannockburn RFC to Tillicoultry on Saturday hoping to get revenge for a narrow defeat imposed by the visitors earlier in the season. The Rams started the match well and soon had the Bannockburn defence under pressure and were rewarded when David Cree scored a try after some great play. Jack McClymont increased the Rams lead when he finished off another fine move. As to be expected, Bannockburn started to win some ball of their own and started to make gains into the Rams territory. The home defence held and in fact scored again when scrum half, Lewis Coutts took a quick tap penalty and outpaced the visitors defence to touch down under the posts. Gregor Manson added the conversion. Bannockburn responded with some more forays into the Hillfoots half and were successful when they scored a converted try of their own. The Rams responded with a try scored by David Davidson to take them into the break with a 22- 7 lead. The second half got under way in much the same fashion as the first and it was not long before Jack McClymont another try which was converted by Manson. For the next twenty minutes it was the visitors who dominated play and got themselves back into the match when they scored two tries. As the match entered the final quarter it was a try from Gavin Spowage that took the steam out of the Bannockburn fightback. As the clock wore down to no side the Rams secured a good win when Manson converted a fine try scored by David Simpson. Mitch McEwan added the icing to the cake when he crashed over in the last play of the game. 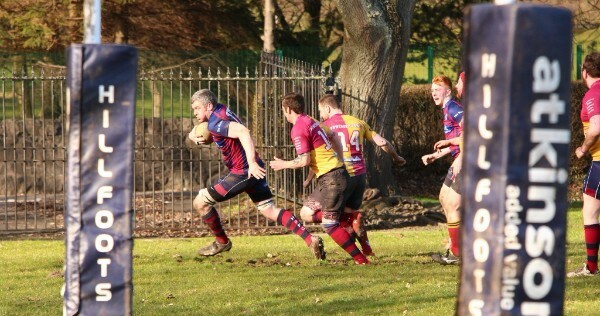 The 1st XV are at home to Carnoustie RFC with a 3pm kickoff, in our last league game of the season. With only 1 point between us and 1,000 points scored this season and Blairgowrie chasing us all the way to the end, here’s hoping to lost more points to see the season out in style! It’s Easter Sunday! If you need to run off your Easter eggs, come down to the Park at 1000 for a fun game of Tag rugby – all ages from 5 to 75 can play!